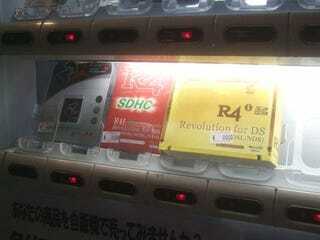 Earlier this summer, a vending machine selling R4 devices appeared in Osaka's electronics district, Den-Den Town. The vending machine will be removed from the area. The vending machine came in the wake of a crackdown on R4 cartridges which can be used to play pirated video games. As we posted previously, Nintendo announced that it and 54 software game companies were filing a lawsuit with the Tokyo District Court against companies that import R4-type devices, using the Unfair Competition Prevention Law as the legal grounding. According to Nintendo, such devices hurts the growth of the entire game industry and steps must be taken regarding the legality of R4 carts. It's important to note that this legal injunction is for Japan only. In addition to the suit, Nintendo launched a website devoted to collecting information about R4 sellers. "It's getting increasingly difficult to track down R4 sellers as day by day they get more ingenious, flourishing online and complicating matters," said Nintendo in a written statement. Because of this, Nintendo is calling on the strength of the masses to eradicate the sale of these devices. The website Nintendo has set up has an anonymous form that can be filled out. Selectable choices include retail stores, internet shops, online auctions selling R4 devices. Another choice includes "game software uploads" — or those sites or individuals making DS games available online. There's also spaces for dates and time, a box for details and another box for the shop's address or home page. Nintendo has said the information collected via this site has been "extremely useful".